Award-winning pianist, composer, orchestrator and producer Jean-Michel Bernard will perform live at TIFF18! Bernard is the favourite composer of director Michel Gondry, having produced the soundtracks of many of his films, including La science des rêves, for which Bernard won an award at Cannes. The French composer is well-known for his unique compositions for the soundtracks of famous films such as Paris-Manhattan (directed by Sophie Lellouche), Hugo (Martin Scorsese) or Madame Bovary (Claude Chabrol). He was awarded for his accomplishments by the European Composer and Songwriter Alliance, and in 2017 he was honoured with the SACEM Grand Prix. Recently, Jean-Michel Bernard was named a Steinway Artist, being one of the important personalities in the field of music who exclusively plays the keys of this remarkable instrument. 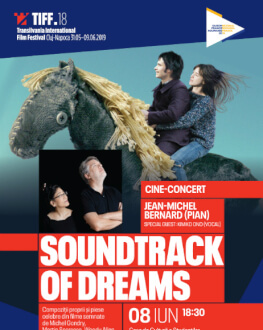 The “Soundtrack of Dreams” cine-concert includes his own creations, as well as famous songs from other composers who wrote music for films, including Lalo Schifrin or Ennio Morricone. Special guest for the evening will be Kimiko Ono, the soloist that Bernard has been playing with for more than two decades. The event is organized as part of the “Romania-France Season 2019” at TIFF.